Tony Reinke interviews Kevin Vanhoozer over at Desiring God on what it means to be a disciple of Christ in a culture of short attention spans, media spectacle, constant and global cyber-connectedness, virtual reality, gaming, and the fear of being disconnected from our virtual communities or missing out on the next big news. There are some very important observations here on technology-related habits and patterns that all too often get an automatic pass and go completely unexamined by large numbers of Christians. If, for example, you find yourself spending significant amounts of time reading Christian blogs, or texting, tweeting, facebooking, emailing or chat-rooming about Christian subjects online (like how to be a better, more effective Christian) instead of fellowshipping or interacting with people in the same room as you, you may be hurting yourself and your local church body far more than you are benefitting anyone you may "connect" with online. In other words, while there is a healthy place for online Christian ministry and resources (this is a blog post linking to an online interview, after all), if it comes at a cost to our own marriages, families, neighbours or brothers and sisters in Christ in the local church - actual real life, face-to-face relationships and interaction - we may be bowing to a cultural idol rather than following a living Savior. There are also some critical cautions to parents here regarding "screen time" and in particular, gaming. And I'm not talking about the content of what our children watch or play, but rather the formative power over time of the media and technologies they use regardless of the moral content of the applications. Don't hear me wrong: content is important as well. (A brief reflection on content can be found here.) However, I would argue in the long run content is of lesser lasting importance to the formation of children's patterns of thought and life than the technologies themselves that children spend large amounts of time exposed to, even if the moral content of what they are playing or watching is "G" rated. I would say this for the same reason I would say that children who grow up in a home where the parents are always arguing and at odds with other will be harmed and maladjusted even if the parents always use proper English and never use four-letter words when they argue. The real (de)formative part for the children is the consistently broken relationship, the constant conflict in the parents' interaction, more than the cutting remarks themselves that the children overhear their parents yelling at each other. We are formed by what we do, especially by what we do often because we desire doing it. We are formed far more by the patterns and habits and time-uses of life than by what we claim to think or say we believe or by what we give mental ascent to. 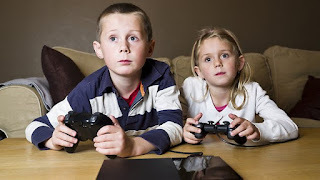 Gaming, especially frequent and prolonged, can be training your child to disconnect from real life relationships in their preference for virtual characters. And gaming can be forming them to dislike real world activities in favour of virtual accomplishments - completing the quest, getting to the next level, achieving the high score. These are things that have no significance in this life or in the world to come and they can keep you from things that have eternal significance. Are your kid's screen-time habits feeding or starving their eternal souls? For that matter, what about yours and my screen-time habits? I would encourage setting aside about 25 minutes or so to thoughtfully read and ponder this insightful piece of theological cultural engagement and critique. Pouring yourself a good strong coffee might not be a bad idea either. I also humbly propose that as you read the interview with Vanhoozer, if you find yourself tempted to tweet catchy phrases or to check your email or texts part way through, or to put on a movie or video game for your kids so you can get some quiet time to read this without interruptions (from real people), you may be self-authenticating some of the key observations in this interview. And that's not really a good thing. If you really want to be counter cultural, read this and then get together with someone, you know, like, face-to-face, and discuss it. Perhaps then a second cup of coffee is in order.